When completed in 1905, TSS Caronia, at nearly 20,000 gross tons, was the largest Cunarder to date. She was an important liner for Cunard in that she and her sistership, Carmania, were built by John Brown on the Clyde to directly compare the performance of standard reciprocating steam engines with the revolutionary new steam turbine propulsion plant. Known as the 'Pretty Sisters' throughout their long and successful careers, Caronia and Carmania were identical other than in their propulsion units and were effectively test beds for the machinery of the two express transatlantic liners Cunard were planning - the giant sisterships, Lusitania and Mauretania. As the turbine-driven Carmania proved over two knots faster than Caronia, turbine engines were chosen for the subsequent record-breaking Lusitania and Mauretania liners and became the standard method of propulsion used right up until QE2 was built for Cunard in 1969 then re-engined with diesel-electric engines in the 1980s. Edwardian and Victorian engineering excellence are beautifully represented by TSS Caronia and London's Tower Bridge in this bustling Thames River scene. 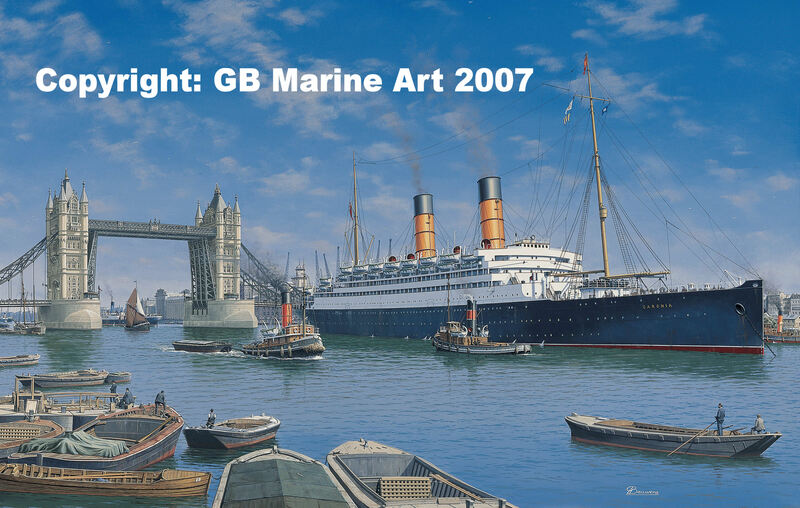 This Limited Edition of 300 high quality prints is second in our planned trio to feature Cunard's famous Caronia liners by Gordon Bauwens. Each artist-signed print comes with its own Certificate of Authenticity and is produced to the highest quality using digital stochastic offset litho printing technology. 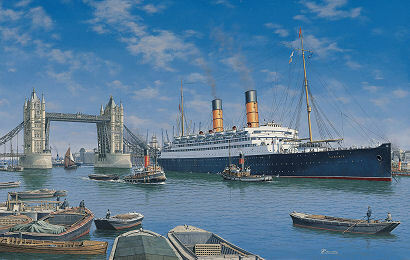 From an original oil painting by Gordon Bauwens showing Cunard's Caronia on the Thames, 1920s. Limited edition of 300 prints and 30 Artist Proofs each signed by the Artist.